VTR 2007 was held July 17th - July 21st in historic Valley Forge PA and was hosted by Delaware Valley Triumphs. It was a double birthday party, celebrating 50 years for the TR3 and 30 years for the host club. 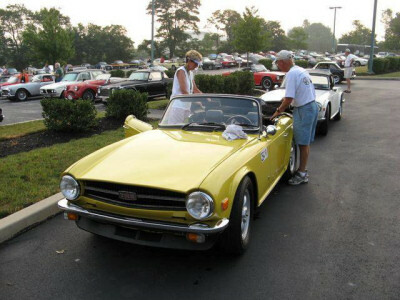 With over 500 people and close to 300 cars in attendance, it was a huge success which required years of preparation. The only thing they couldn't control was the weather which, for the most part, cooperated. For the most part the rain held off until late afternoon and evening, but when it rained it POURED! And POURED and POURED. I had the foresight to install new wiper blades for the first time in 10 years which worked quite well. I also pulled the aluminum windshield cap off and laid down a couple of strips of chalking to eliminate that pesky leak on the driver side. Only problem.....it now leaks on the wife's side.....sorry hon....want to go to the Mall? I also learned that my trunk will hold water quite nicely. Seeing as my trunk rubber seal is in good shape I assume it's leaking in from a body seam. One of the best parts of attending a show like this is getting to put a face with a name, especially all the great folks from the Triumph Mail List. I got to meet some regular contributors to the List as well as a few lurkers. In addition there were a few that I met back in 1999 when VTR was held in Portland ME, people like Fred Thomas, Bud Rolofson, Bob Lang & Joe Merone. On Wednesday, Jeanne and I took part in the "FUN" Rally that almost ended many a marriage for the participants. You see, unbeknownst to novices like us, the object is to answer as many questions AND finish the rally in 2'15"...... NOT......answer ALL the questions, by back-tracking over and over again, and finishing in about 4 hours with an empty tank and a full bladder! What made it especially exciting was the torrential downpour that hit about 5 miles from the end. Up goes the top, in comes the rain (on Jeanne's side only), the windows fog up, Jeanne's hair curls in the humidity while her shorts get wet from the drip, drip, drip. But we finished......we didn't win anything but we did finish and the route through the countryside was spectacular. Here we are leaving on the "FUN" Rally Top up, Top down, Top up... Jeanne got real good at doing this. Notice the wet towel on the hood! 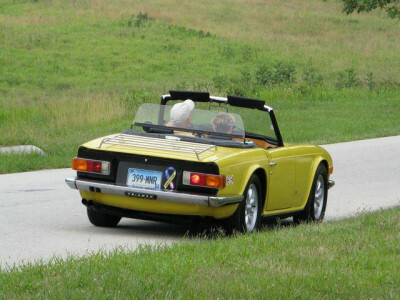 During the 5 days we were gone the TR6 covered 630 trouble free miles and averaged 27 mpg on the highway at a steady 60 - 65 mph. While the car was moving, the temperature gauge never went over the 1/2 way mark and that's with no mechanical fan. The electric fan however suffered a temperature relay failure so I had to cycle it on and off when stuck in any traffic. Luckily, part of Dan Masters' wire harness includes a 3-way switch (on, off & auto) so I just reached under the dash and flicked it on when stuck in traffic. The only other problem was a very slight coolant drip at the thermostat housing. I fixed that by replacing the gasket when I got home. Dumb: Driving 2 hours toward home on Saturday, taking a short break at a rest area and popping the hood to find oil EVERYWHERE! But there was the oil cap sitting on the battery where I had left it. As bad as it looked, it was mostly splatter and not enough was gone to even add oil to the engine. Smart: Forgetting to replace the cap on the way HOME and not on the way TO VTR. Today (7/23) I spent all day cleaning the oil mess from under the hood. I had to remove the battery, battery box, valve cover, distributor cap and wires to get it all cleaned up. DUH. I also replaced the thermostat gasket to fix that leak.